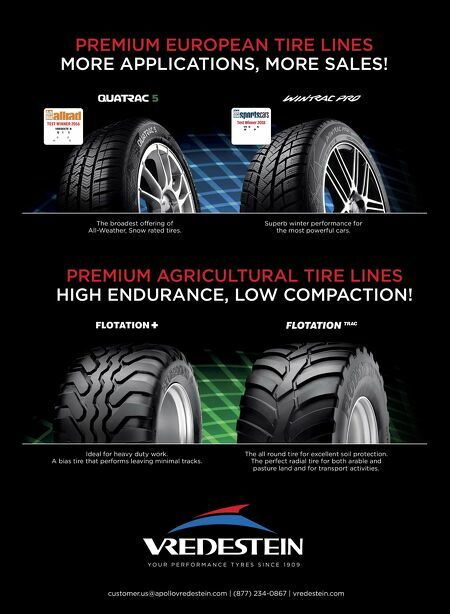 M T D J a n u a r y 2 0 1 9 44 2 0 1 9 F a c t s S e c t i o n : T i r e S i z e s MOST POPULAR DOMESTIC OE PASSENGER AND LT TIRE SIZES AVAILABLE PASSENGER CAR SIZES BY RIM DIAMETER 12-inch: 1 13-inch: 13 14-inch: 26 15-inch: 55 16-inch: 61 17-inch: 59 18-inch: 65 19-inch: 28 20-inch: 31 21-inch: 2 22-inch: 7 23-inch: 2 24-inch: 6 26-inch: 1 There was one 19-inch size added for 2019. Total P-metric/metric sizes: 357 SOURCE: TIRE & RIM ASSOCIATION AVAILABLE SIZES BY LT-METRIC RIM DIAMETER 14-inch: 6 15-inch: 18 16-inch: 37 17-inch: 30 18-inch: 30 20-inch: 22 22-inch: 16 24-inch: 8 26-inch: 3 There were two 18-inch sizes and three 22-inch sizes added for 2019. Total LT-metric sizes: 170 SOURCE: TIRE & RIM ASSOCIATION AVAILABLE SIZES BY LT HIGH FLOTATION RIM DIAMETER 14-inch: 1 15-inch: 21 17-inch: 16 18-inch: 15 20-inch: 17 22-inch: 7 24-inch: 5 26-inch: 3 28-inch: 2 One 15-inch size, one 17-inch size, one 20-inch size, one 22-inch size, two 24-inch sizes, one 26-inch size, and two 28-inch sizes were added for 2019. Total sizes: 87 SOURCE: TIRE & RIM ASSOCIATION TOP U.S. REPLACEMENT PASSENGER TIRE SIZES, 2018 1. 225/65R17 6. 265/70R17 2. 205/55R16 7. 275/55R20 3. 215/60R16 8. 225/50R17 4. 215/55R17 9. 225/60R16 5. 195/65R15 10. 225/55R17 TOP U.S. 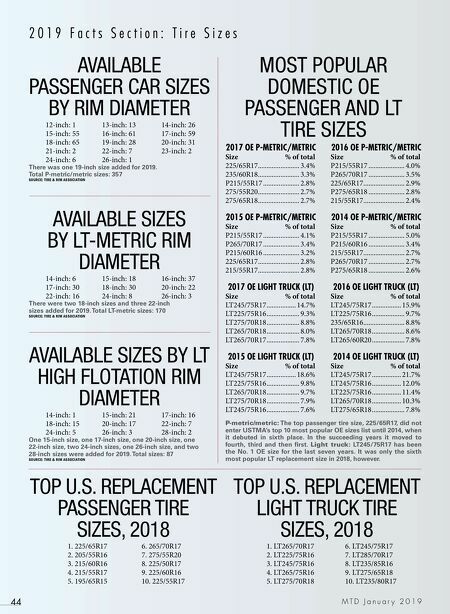 REPLACEMENT LIGHT TRUCK TIRE SIZES, 2018 1. LT265/70R17 6. LT245/75R17 2. LT225/75R16 7. LT285/70R17 3. LT245/75R16 8. LT235/85R16 4. LT265/75R16 9. LT275/65R18 5. LT275/70R18 10. LT235/80R17 2017 OE P-METRIC/METRIC Size % of total 225/65R17 ........................ 3.4% 235/60R18 ........................ 3.3% P215/55R17 ..................... 2.8% 275/55R20 ........................ 2.7% 275/65R18 ........................ 2.7% 2016 OE P-METRIC/METRIC Size % of total P215/55R17 ..................... 4.0% P265/70R17 ..................... 3.5% 225/65R17 ........................ 2.9% P275/65R18 ..................... 2.8% 215/55R17 ........................ 2.4% 2015 OE P-METRIC/METRIC Size % of total P215/55R17 ..................... 4.1% P265/70R17 ..................... 3.4% P215/60R16 ..................... 3.2% 225/65R17 ........................ 2.8% 215/55R17 ........................ 2.8% 2014 OE P-METRIC/METRIC Size % of total P215/55R17 ..................... 5.0% P215/60R16 ..................... 3.4% 215/55R17 ........................ 2.7% P265/70R17 ..................... 2.7% P275/65R18 ..................... 2.6% 2017 OE LIGHT TRUCK (LT) Size % of total LT245/75R17 ................. 14.7% LT225/75R16 ................... 9.3% LT275/70R18 ................... 8.8% LT265/70R18 ................... 8.0% LT265/70R17 ................... 7.8% 2016 OE LIGHT TRUCK (LT) Size % of total LT245/75R17 ................. 15.9% LT225/75R16 ................... 9.7% 235/65R16 ........................ 8.8% LT265/70R18 ................... 8.6% LT265/60R20 ................... 7.8% 2015 OE LIGHT TRUCK (LT) Size % of total LT245/75R17 ................. 18.6% LT225/75R16 ................... 9.8% LT265/70R18 ................... 9.7% LT275/70R18 ................... 7.9% LT245/75R16 ................... 7.6% 2014 OE LIGHT TRUCK (LT) Size % of total LT245/75R17 ................. 21.7% LT245/75R16 ................. 12.0% LT225/75R16 ................. 11.4% LT265/70R18 ................. 10.3% LT275/65R18 ................... 7.8% P-metric/metric: The top passenger tire size, 225/65R17, did not enter USTMA's top 10 most popular OE sizes list until 2014, when it debuted in sixth place. In the succeeding years it moved to fourth, third and then first. Light truck: LT245/75R17 has been the No. 1 OE size for the last seven years. It was only the sixth most popular LT replacement size in 2018, however.